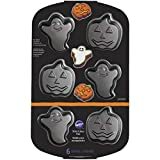 Whether it's Halloween or you're just a bit morbid in the kitchen all year long, bake your cakes into something a bit more sinister with this cool new Skull Cake Baking Pan. 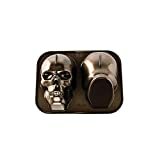 This nonstick, aluminum baking pan makes a three-dimensional cake in the shape of a spooky skull with a scary amount of detail. 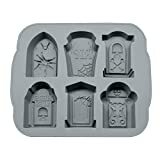 Just fill the front and back halves with batter, bake in the oven, press the two together with icing, and Voila!, a tasty skull ready for blood-splatter icing, gummy worms in the eye sockets, or whatever yummy, ghoulish things you can dream up. 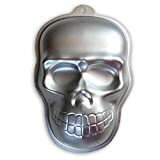 Hmm, I would cut off the top of the cranium, scoop out the cake, and refill with pink, brain-colored ice cream, pudding, or frosting.